You can find a few quick tips to arrange your design to work effeciently on hpdc process. Chamfered and radiused corners are the most effecient design moves. Rounded corner helps to increase velocity of molten metal. Besides that, it will help to reach a more resistant geometry for thermal crack threats. According to parting way, all surfaces which perpendicular to eject direction should be tapered. 90 degree surfaces cause ejection problem and surface defects. Minimum wall thickness for hpdc starts from 1,5 mm and walls should be designed according to part geometry. Wall thicknesses must be designed homogenious and balanced. Be sure that the part has balanced wall thickness. Usually should not exceed 8-10 mm. for traditional pressure casting technology. A lot of parting tips could be written on this page but some basics could be more helpful. Parting line is neccesary to split geometry to each side (fixed and moving sides). 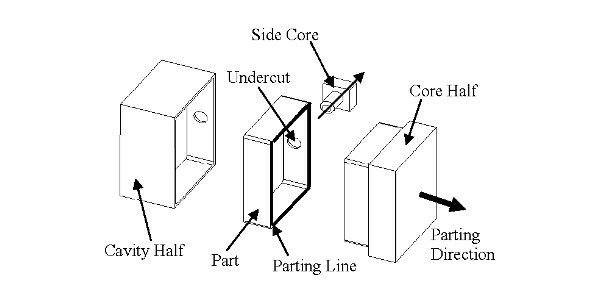 Some critical points to keep in mind while designing are; ejector pin locations to remove part from mold, stucking side before ejector pin move (part should stay at moving side while mold opening), sliding core split lines if it is necessary, a planar split surface if possible (for trimming), gate and runner location planning before split, keep away from undercuts and negative angles (without sliding cores) etc. This brief sketch includes a few basic tips for designing high pressure die casting parts. We kindly invite you to contact with UKD MAKİNA for best solutions at Istanbul Turkey.